MTA's subway and bus services were expected to be fully restored by Wednesday morning, but some lines were seeing delays. Metro-North service was running on a modified schedule Wednesday morning and was seeing delays of up to 20 minutes. A ferocious nor'easter punished the tri-state area with near-blizzard conditions and strong winds Tuesday, burying parts of the region under a foot of snow and others under inches of ocean water. Much of the area's transit had returned by Wednesday morning, but the effects of the storm continue to be felt and commuters were seeing mass delays. MTA subway service above ground resumed at 6 p.m. Tuesday, but several lines were seeing delays Wednesday morning. At 9:30 a.m. the MTA reported delays on the 7, B, D, F, M, N, Q, R and W lines, and commuters complained of packed platforms and a lack of trains servicing the L line through Brooklyn. Underground express subway service, which was suspended Monday night to store trains underground, resumed in time for Wednesday morning's commute. 3 and D trains were running local Wednesday morning in both directions as part of the MTA's Cold Weather Plan. After MTA bus service was reduced up to 30 percent, full service began running normally at 5 a.m. Wednesday. The Access-a-Ride paratransit service has already started taking reservations for Wednesday's commute. The MTA said it would run free bus service to LaGuardia Airport this week to help reduce congestion. Full service on the Metro-North resumed Wednesday, with some delays, after it was suspended at noon Tuesday. The Long Island Rail Road continues to operate a normal schedule with scattered 10-20 minute delays. NJ Transit bus service resumed Wednesday morning with delays and cross-honoring. NJ Transit trains were running on a President's Day schedule Wednesday, with some additional trains during the evening rush, then will return to a full weekday schedule Thursday. Even so, customers reported widespread delays during rush hour, in some cases topping 30 minutes. At some stations, trains arrived already so full that no one else could get on board. PATH service is running on a normal weekday schedule on all lines as of Wednesday morning. NY Waterway ferry service is on schedule Wednesday. Staten Island Ferry is on a modified schedule Wednesday. East River Ferry is on a modified schedule Wednesday following suspensions Tuesday. Amtrak said it would resume regular service for its Acela Express and Northeast Regional trains on Thursday, as well as all other services that operate between Boston and Washington D.C./Virginia. Empire Service will operate on a modified schedule. The Bee-Line System resumed service at 4:30 a.m. Wednesday. NICE bus service in Nassau County returned to normal Wednesday after earlier suspensions. There was still a lot of snow on the roads Wednesday morning and black ice is a major concern as Tuesday's wet snow freezes amid frigid temperatures. Road crews are trying to prevent black ice, but all drivers should be cautious of icy conditions. Motorists, especially tractor-trailer drivers, were warned to anticipate scheduled and unscheduled road closures as the area cleaned up. Slushy snow was still on the streets of midtown Wednesday morning. A travel ban in Connecticut was lifted Tuesday evening, and all travel and tractor trailer bans in New York were lifted Wednesday afternoon. People drove despite the warnings, and accidents were reported on roadways across the tri-state. A car crashed into a tree in Mastic Beach, injuring two people, and a car careened into a pole in Brookhaven, though no one was injured. New Jersey State Police said Wednesday they had responded to at least 228 motor vehicle crashes since the storm hit. Other drivers were seen stuck or stranded on roadways covered in snow. Bridge speed restrictions were lifted after Wednesday's morning rush. Alternate side parking is suspended in New York City through Saturday to facilitate snow removal efforts. 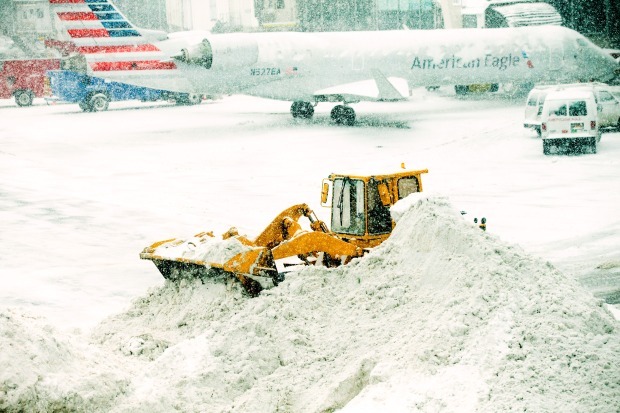 John F. Kennedy International, LaGuardia and Newark Liberty International saw thousands of canceled flights as the storm battered the region, and all three airports warned of anticipated high volume Wednesday as customers grounded by the nor'easter tried to get out -- or come home. The Port Authority, which oversees the three airports, says most flights are fully booked on Wednesday because of Tuesday's cancellations, and people should expect very heavy traffic on the roads to the airports. Anyone without a booked flight should not come to the airports. Passengers are urged to use mass transit to the airports, including the (temporarily free) Q70 LaGuardia link and the AirTrains to JFK and Newark. The Port Authority also tweeted that people should consider using Uber, as the ride-sharing service was offering $10 rides from LaGuardia to anywhere in New York City. A snowstorm last month caused chaos at LaGuardia Airport as travelers flocked to the notoriously cramped airport to try to catch flights the day after the storm; News 4 cameras captured passengers running on the gridlocked highway and roads to try to make their flights at LaGuardia. The airport has tried to mitigate traffic at peak travel periods since then.